To Learn More about the New Redesigned Robust ELITE Version LED Gloves, Click HERE! and Durable Switch to Activate Your Multi-Mode Strobes! Dance Routines, Cheer, Light Shows, and Much Much More. The Black LED Gloves are black with white fingertips, so the Light can shine through. The black makes your hands disappear to focus attention on the light coming from the finger tips. The dark color also hides dirt and grime. These NEW Elite LED Gloves have a wide array of colors in each finger tip including: Red, White, and Blue. You get to Control the modes with a New Redesigned Switch on the Controller Box. You can cycle through all the Amazing Strobes in each Glove, and Create tons of amazing Patterns and Designs. The Black LED Gloves are very stretchy and fit almost every hand. Each Glove contains super powerful LEDs and Amazing Patterns at Unbeatable Low Price. Be the First to Have a pair of NEW Elite Version LED Gloves with New LED Color Combinations! 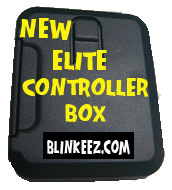 - The switch that operates these modes is on top of the controller box and has been redesigned for durability. No need to fuss with a screwdriver tool to get inside the controller box. It is now simple and effortless! Midnight Mitts are not intended for children under 10. Looking for a Custom Color Combination for your LED Gloves? Need Custom LEDs for a School or Dance Function? Call or Email Us - We Do Custom Gloves!